The newly elected Ducsu Vice-President, Nurul Haque Nur, again demanded a fresh election to the Dhaka University Students’ Union. He made the call while addressing a press conference at Modhur Canteen this evening, a day after newly-elected leaders called on Prime Minister Sheikh Hasina at her official Ganabhaban residence. Nur said: "The Ducsu poll was not held in a free, fair and credible manner. So we want a fresh election." "The election tarnished the image of the Dhaka University and the person responsible must stay away from all the process the next time," he added. Asked about joining the oath-taking ceremony as a VP, he replied: "I will take the decision after observing the situation." 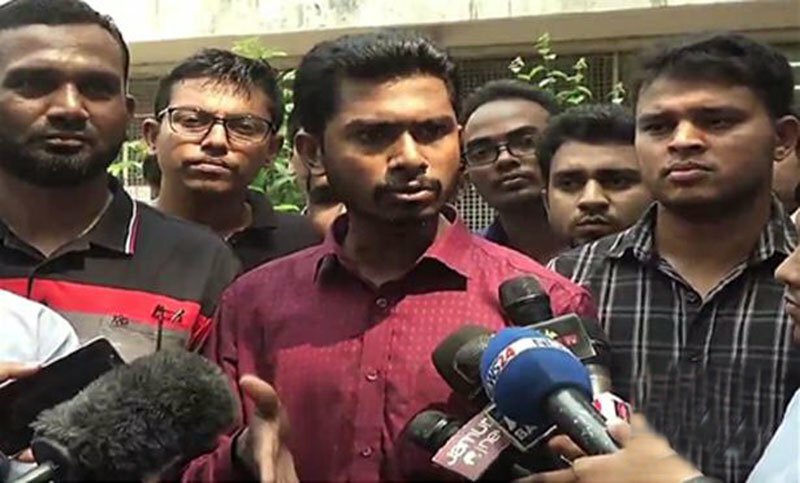 Earlier in the day, activists of Pragatisheel Chhatra Jote, an alliance of left-leaning student organisations, placed their five-point demand which included cancellation of the polls result. They announced that they would boycott exams and classes scheduled to be held tomorrow and bring out a rally from Raju sculpture and march to the DU vice chancellor’s office to press home their demands. Yesterday, Nur met Prime Minister Sheikh Hasina at Gono Bhaban and sought her all-out cooperation to make the Ducsu a functional body for the welfare of all its students. Nur said: "The Ducsu poll was not held in a free, fair and credible manner. So we want a fresh election."